Sea Sponges are a renewable natural resource that are harvested from the ocean. Natural sea sponges, unlike artificial sponges, naturally inhibit the growth of bacteria, are environmentally safe, economical, 100% biodegradable, and a quickly renewable, sustainably harvested natural resource. Sea sponges are native to Florida coastal waters and have been used for a variety of purposes for more than 2,000 years. 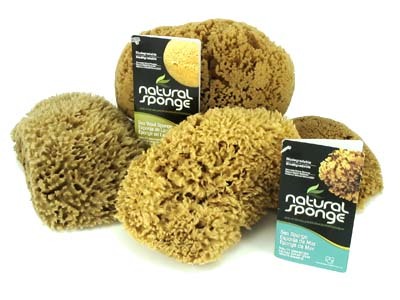 Natural sponges have several distinct advantages over synthetic sponges. Sea sponges are much more absorbent, more durable, longer lasting, will not stain or retain odors, and their soft texture promotes a more thorough and less abrasive cleaning. Although over 5000 species of Sea Sponges have been identified so far, only 12 of them are currently harvested and used for commercial purposes. Natural sea sponges have been the cornerstone of our company from the very beginning, and for over 50 years now we have been sourcing and providing the highest quality sponges available. Our experience and know-how have not only made us the largest sponge supplier in the U.S., but has built our reputation for providing quality products that consistently meet our customer’s high expectations. By doing our own processing and holding large inventories of different sponge varieties, we are able to maintain our high standards and the quality of the sponges we offer. We offer 3 different varieties of natural sponges including, Wool, Yellow and Grass sea sponges. Choosing the right tool, or sponge, for the job makes a big difference in time, money, and effort, so we offer different types of sponges for various applications. And regardless of the application or project you’re working on, Acme has a natural sea sponge to help you get it done. Of the twelve varieties of natural sponges harvested, the Wool, Yellow and Grass varieties are some of the most cost-effective and versatile sponges available. initially sorted for quality at the point of purchase, are then sorted again at every stage of processing; and before final packaging, where our team rejects any sponge that does not adhere to our rigid standards. Our natural sponge team boasts over 160 years of experience and skill, resulting in the highest quality natural sea sponges available. 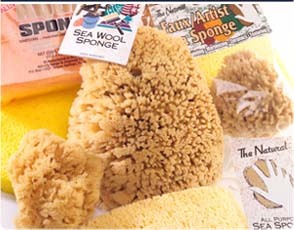 We offer several different types of natural sea sponges under “The Natural” brand including “Wool”, “Yellow” and “Grass”. “Wool” (or “Lamb’s Wool”) is one of the softest types of sponge available and is often used for washing more delicate surfaces, or where it is critical that dirt and grit be pulled away, without scratching or marring. “Yellow” Sponges are somewhat stiffer than Wool and are great for soft scrubbing or exfoliation. “Grass” sponges have finer pores than either the Wool or Yellow sponges, and are more economical. Our “The Natural” brand sponges are often used by car enthusiasts and exotic car owners to safely clean the vehicle without scratching or marring the finish. Because natural sea sponges completely release the dirt and grit (pulled away from the finish and into the pores) when rinsed, they are also often preferred as a means to remove abrasive and corrosive brake dust from the tires and wheels. In addition to automotive applications, natural sea sponges are used for bathing sensitive skin on both mothers and babies, cosmetic application and removal, hand washing delicate china and glassware, safely polishing silver and antiques, as well as wallpaper and faux finish applications, wall washing and general cleaning.